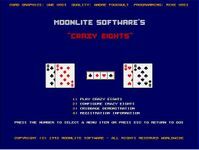 Crazy Eights is a reimplementation of the classic card game for DOS. The rules can be tweaked to allow the turn skip, pick up extra cards, or changing suits rules. The registered version includes a copy of another card game: Cribbage.